In a controversial move, India abstained from a U.S.-sponsored resolution on human rights in Sri Lanka at the United Nations last week. India had supported similar resolutions in 2012 and 2013, but abstained after the new resolution appeared much tougher on Sri Lanka than prior versions, calling for an independent international investigation of alleged war crimes committed by Sri Lankan forces in their war against the Liberation Tamil Tigers of Eelam (LTTE). In explaining its reasoning for the abstention, the Ministry of External Affairs said, “It has been India’s firm belief that adopting an intrusive approach that undermines national sovereignty and institutions is counterproductive … any external investigative mechanism with an open-ended mandate to monitor national processes for protection of human rights in a country, is not reflective of the constructive approach of dialogue and cooperation envisaged by UN General Assembly resolution 60/251 that created the HRC in 2006 as well as the UNGA resolution 65/281 that reviewed the HRC in 2011.” Despite India’s abstention, the resolution passed with 23 in favor, 12 against and 12 abstaining. India’s relationship with Sri Lanka has been troubled in recent years, mostly due to internal frictions between Tamil interests and the interests of the central government in New Delhi. The decision to abstain on the vote is an assertive move by New Delhi and has drawn criticism from Tamil leaders who continue to push for a strong Indian stance on Sri Lanka’s human rights abuses. That New Delhi abstained despite unanimous support of the resolution by the Tamil Nadu Legislative Assembly further highlights New Delhi’s independence in foreign policy-making. In 2013, after much lobbying by Tamil politicians, Indian Prime Minister Manmohan Singh chose not to travel to the 2013 Commonwealth Heads of Government Meeting which was being held in Colombo. Tamil Nadu Chief Minister J Jayalalithaa requested that there be no “titular, ministerial or official” Indian participation in CHOGM. While External Affairs Minister Salman Khurshid did end up attending the meeting in Singh’s stead, the incident highlighted the salience of narrow domestic political interests in India’s relations with important neighboring states. The resolution called for an independent international investigation into alleged war crimes and human rights violations in Sri Lanka. India’s opposition to the resolution sends a strong message to Colombo at a time when it was sorely needed. Relations across the Palk Strait have been strained during Mahinde Rajapaksa’s tenure so far but bilateral talks are producing results. 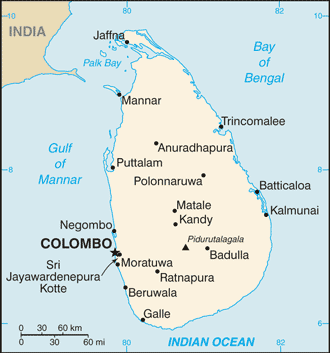 Provincial elections in Sri Lanka, particularly in the Tamil-dense northern areas of the island, were largely pushed for by Indian diplomats and are seen a positive development in the island nation’s post-conflict transition. The CHOGM 2013 fiasco was an undesirable setback for New Delhi amidst this progress. New Delhi needs to play the long game with Sri Lanka and doing so will involve carefully moderating between meeting the needs of domestic interest groups but also steadily winning geopolitical overtures with Rajapaksa’s government in Sri Lanka. Between Singh’s absence from CHOGM 2013 and this year’s abstention on the human rights resolution, New Delhi has oscillated between those two objectives. Against the backdrop of expanding Chinese influence in Sri Lanka, New Delhi’s interest will be best served by slowly but surely pursuing diplomacy on its own terms with Rajapaksa’s government (which is likely here to stay for a good while).